i have already shared the south indian version of gathiya recipe which is also known as kara sev recipe. as compared to gathia recipe, kara sev is typically prepared during the festival seasons especially during diwali festival. 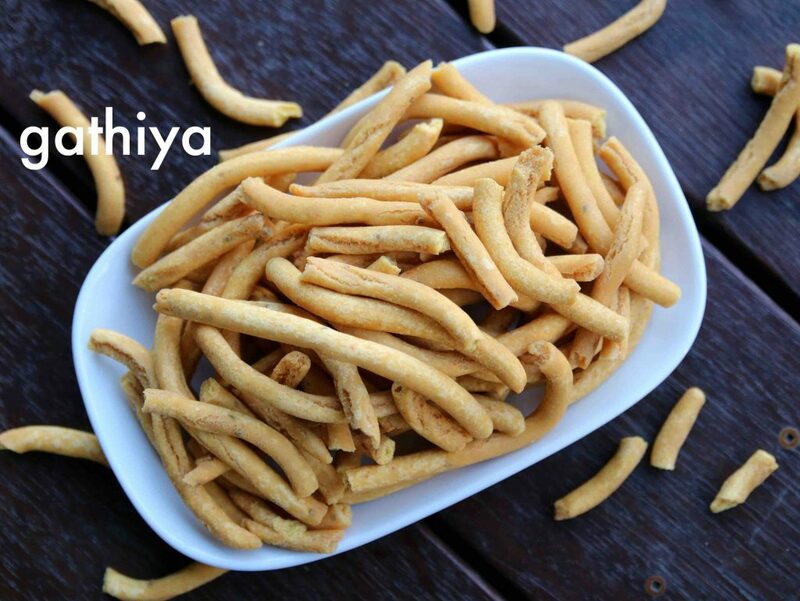 whereas, gathiya sev is very common all the year as it is mainly targeted as evening tea time snacks. in addition the south indian version is more crisp and hard due to the extra rice flour added in the ingredients. also as the name suggests, it can be spicier compared to the gujarati version. having said that, both share same thickness, size and texture. hence more commonly these 2 recipes are confused with each other. 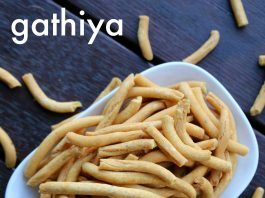 the gathiya recipe is extremely simple, yet some tips, suggestions and variations while preparing. 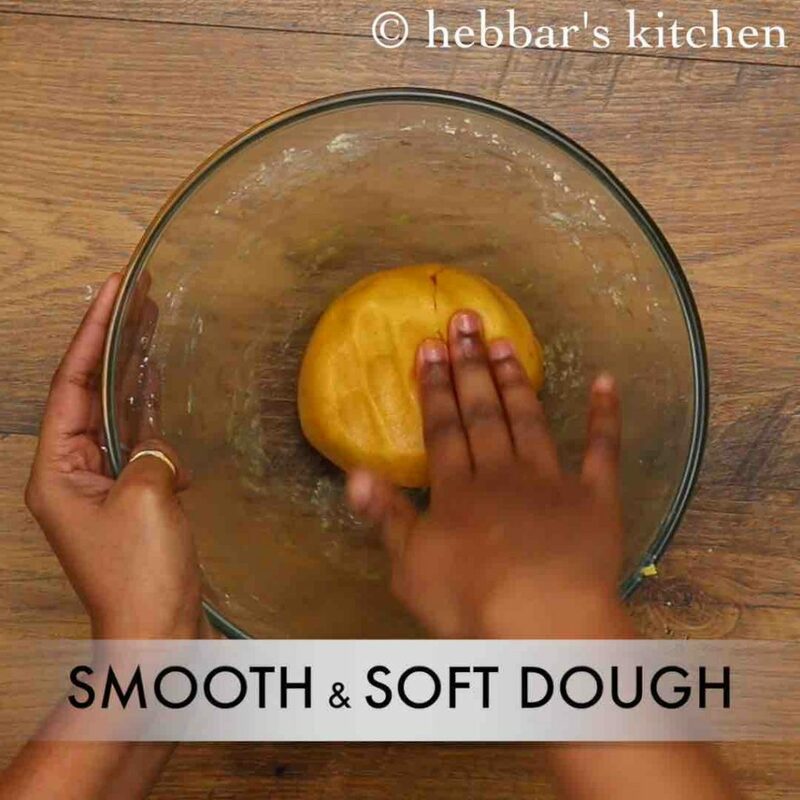 firstly, make sure to knead the besan dough to a smooth balls by adding water in small batches. 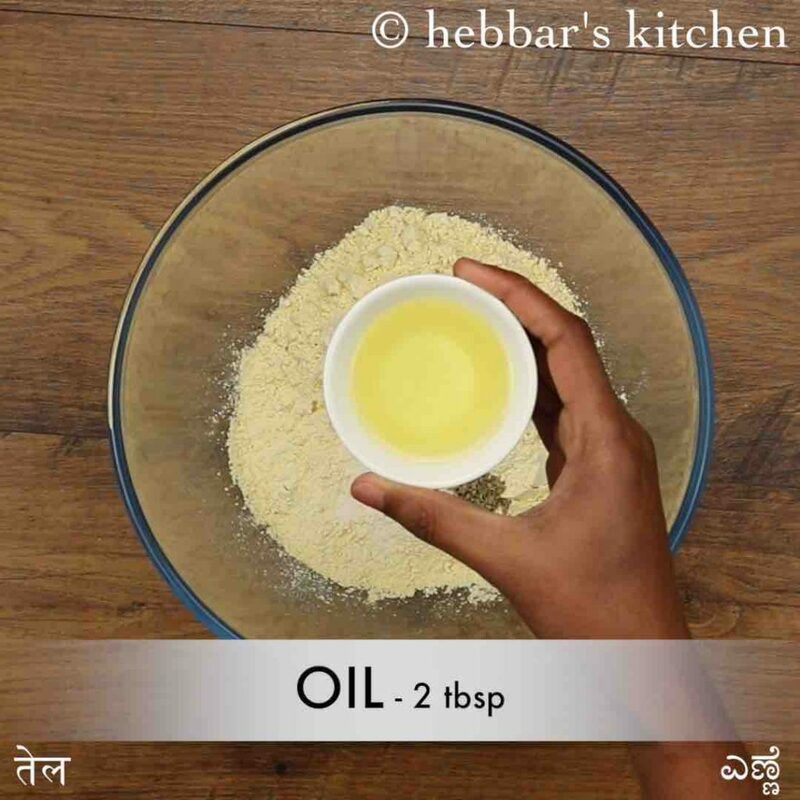 once it forms the shape, grease the dough with oil knead further till non sticky dough is formed. secondly, i have used a medium sized sev shape to prepare the ganthia recipe. you can vary it accordingly to your required size and shape. lastly, the gathia recipe has a very long shelf life and can be preserved for months. store it in an airtight container in a warm dry place. 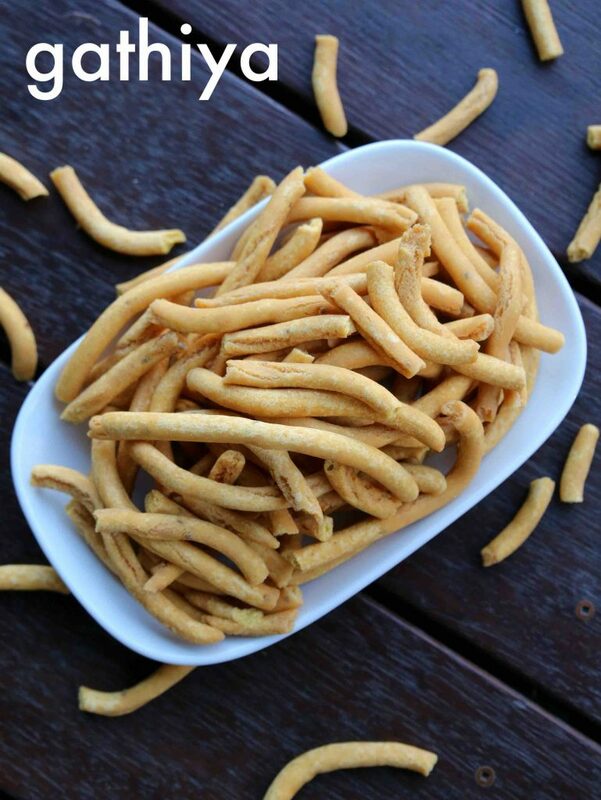 also for deep frying use fresh oil and do not reuse deep fried oil, to avoid the stale smell. 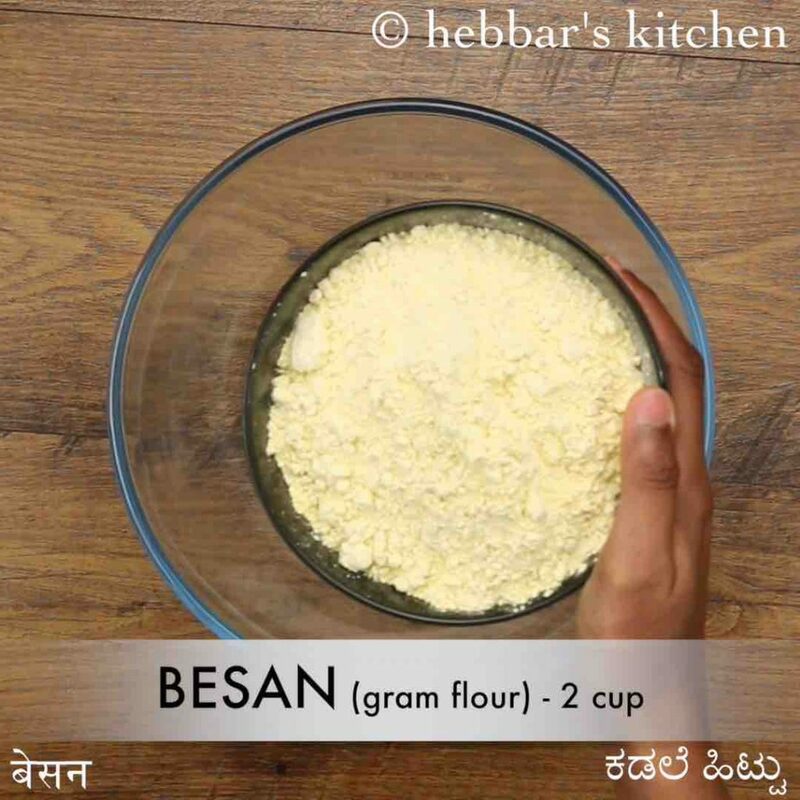 firstly, in a large mixing bowl take 2 cup besan. 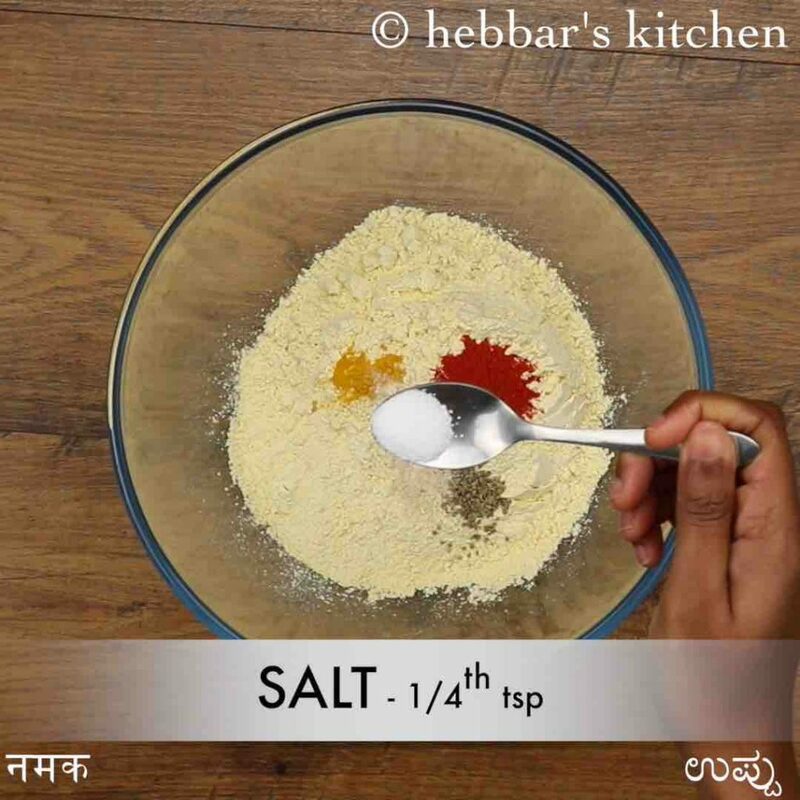 add ¼ tsp turmeric, ½ tsp chilli powder, ¼ tsp ajwain, pinch hing and ¼ tsp salt. also, add 2 tbsp oil and ¼ tsp baking soda. mix well making sure all the spices are mixed well. now add ¼ cup water (or as required) and knead the dough. 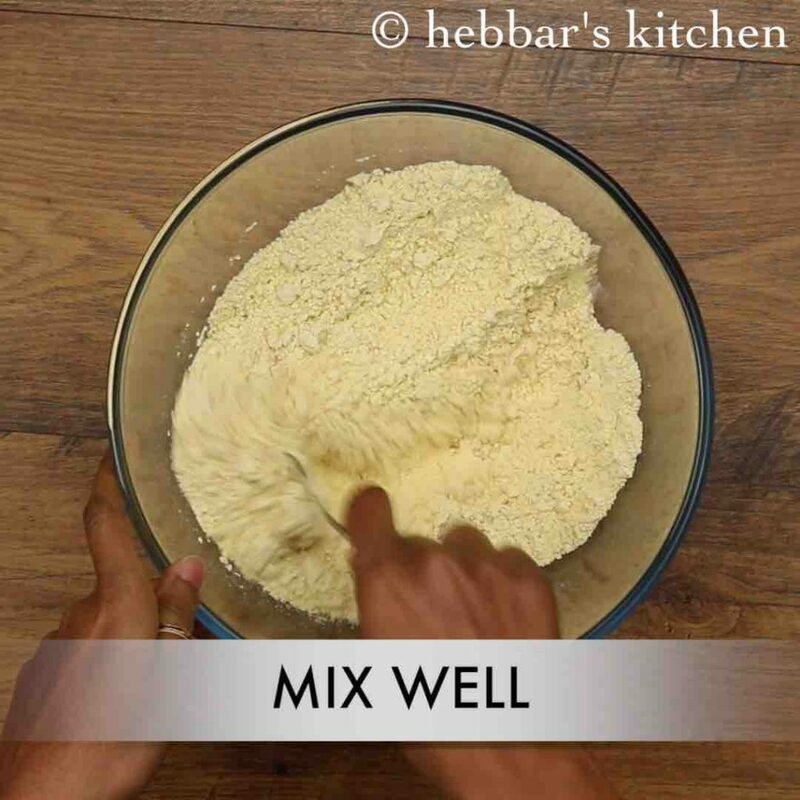 the dough will be slightly sticky, grease hand with oil and knead to smooth, soft and non-sticky dough. 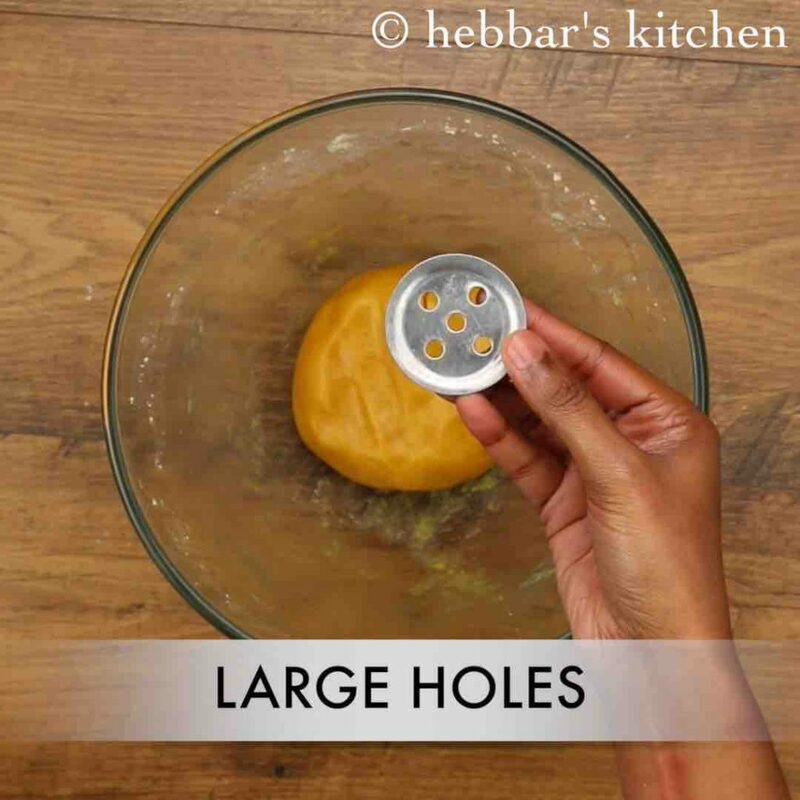 grease the large-holed mould with some oil and stuff dough into it. 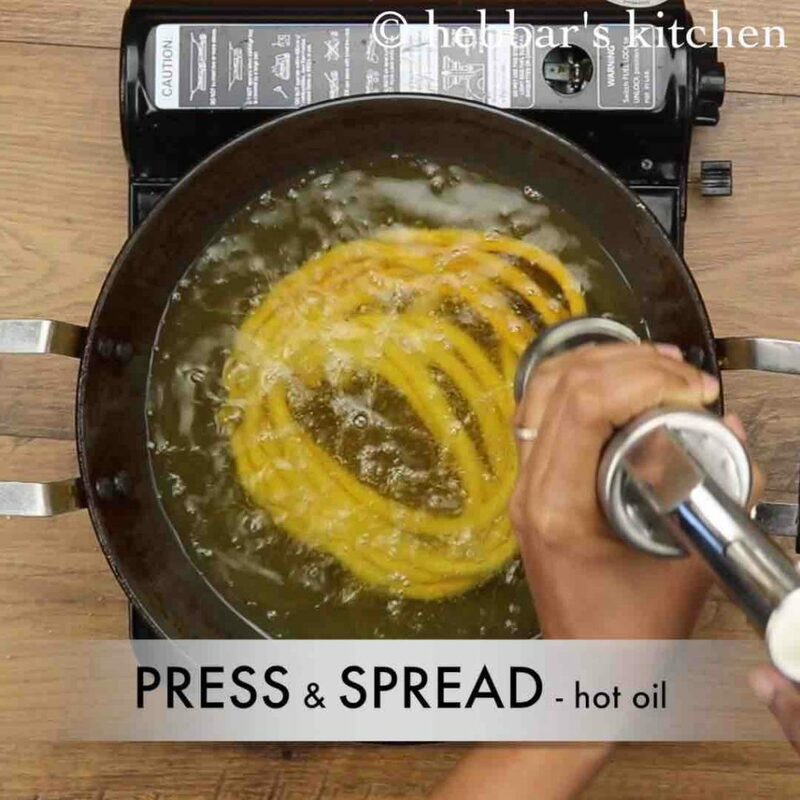 further, press and spread the gathiya / sev in hot oil forming a circle in the oil and make sure you do not overlap. 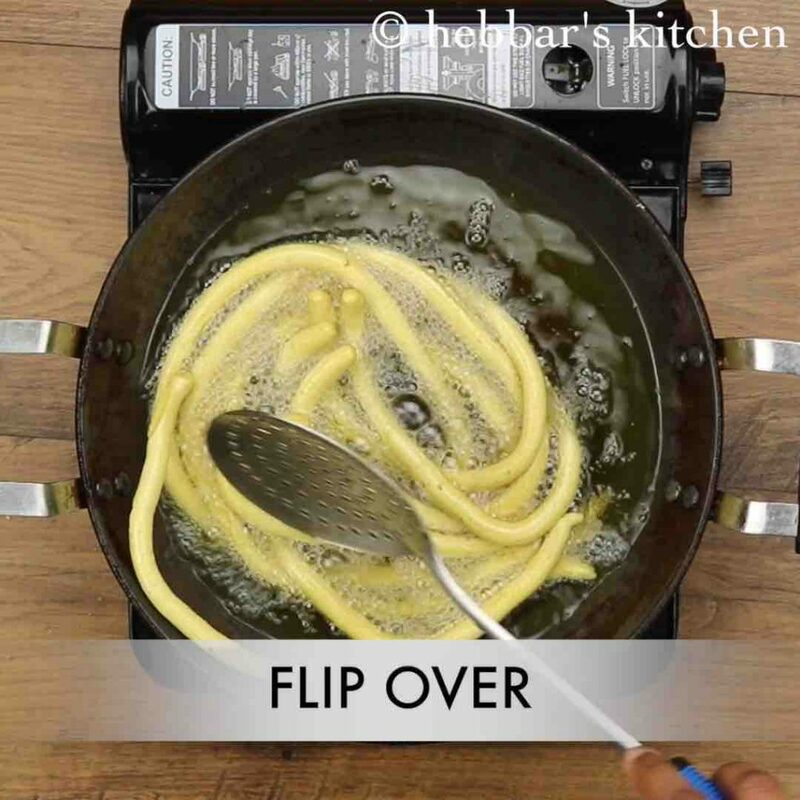 after a minute, flip over and fry the other side. 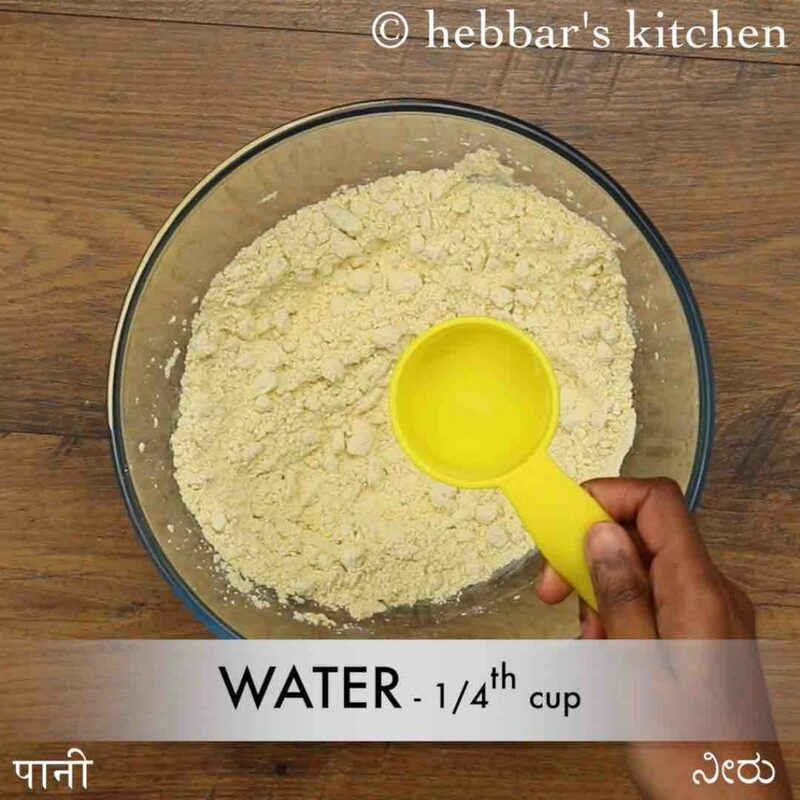 finally, drain over kitchen paper to absorb oil and repeat making more gathiya with the remaining dough. after a minute, flip over and fry the other side till it turns golden and crisp. firstly, do not add rice flour to the dough mixture as gathiya need to be crunchy yet melt in the mouth. additionally, instead of chilli powder, you can use pepper or combination of both. also, make sure to fry in hot oil on medium flame. else gathiya / thika sev will be raw from inside. finally, gathiya stays good for a month when stored in airtight container.